Thank you Boston for the street trees! A big thanks to the City of Boston Parks Department for the 5 new trees planted today on Mansfield Street! They will be a great addition to make the street nicer! The City of Boston Transportation Department and Public Works Department are proposing traffic safety improvements on Everett Street between Adamson Street and Aldie Street in Brighton. A public meeting to discuss the proposed design will be held on Wednesday, April 25 @6:00 PM at the Brighton Marine Health Center. How big is your shadow? With so much talk at the recent Harvard meetings about the size of shadows that new construction in Barry's Corner might cast onto Smith Field, I thought it would be interesting to find some real-world examples in our neighborhood. The office building at the corner of Cambridge St and Everett St seems to be about the same height as what Harvard tentatively proposed along the eastern border of Smith Field. 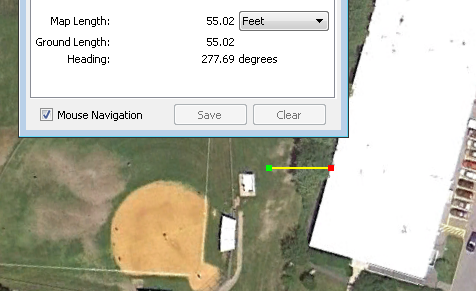 At 9:45 this morning the shadow reached almost to the edge of the parking lot, which according to the ruler in Google Earth, would be approximately 55 feet. Later in the day and as summer approaches, the shadows would be shorter as the sun moves higher in the sky. The yellow line in this image from Google Earth measures 55 feet. The taller buildings suggested in Harvard's diagram are farther from Smith Field, so while their shadows would be longer, some of those shadows would be cast onto the other buildings.